This incense burner in the shape of a round ting (cauldron) features two standing handles along the rim. Three tubular legs are joined to the body, and the legs have raised patterns. The entire vessel is covered with bright yellow glaze, which is very translucent and, when seen from the side, has a slight rainbow luster to it. On either side of the body is an engraved animal mask, between which one finds cash-design decoration and flowers. The bottom is engraved with an inscription of four characters in regular script that reads, "Made by Chou Tan-ch'üan", making this the only work in the Museum collection that is engraved with Chou's inscription.. Chou Tan-ch'üan flourished from the late 16th century to the early 17th century, excelling in the imitation of ancient ceramics. He created unusual vessel shapes in wood and also displayed originality in creating garden scenery with piled rocks. 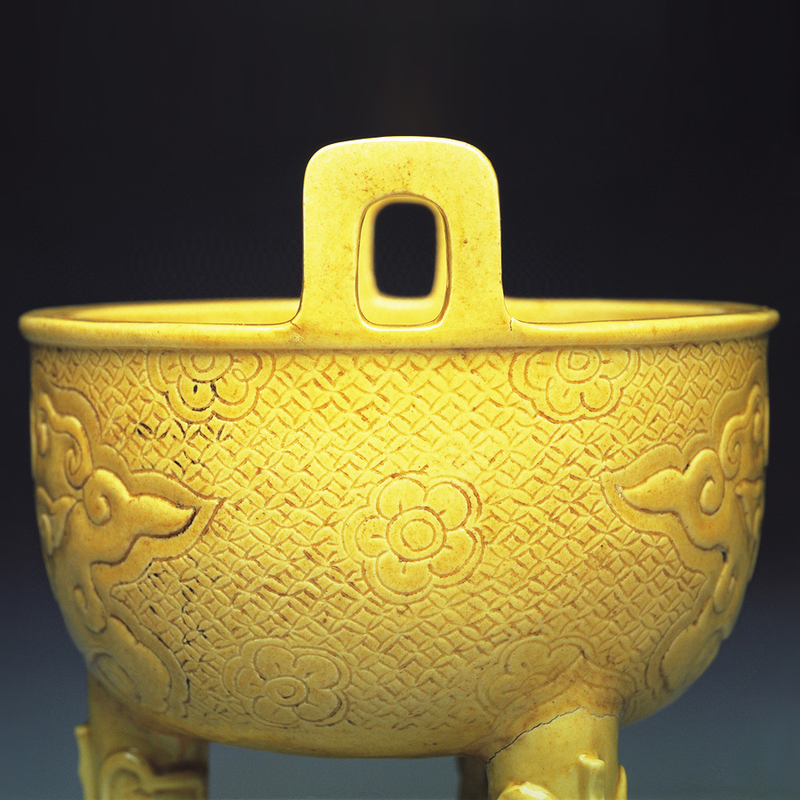 It is said that in the late Chia-ching era (1522-1566), Chou Tan-ch'üan made such a faithful imitation of a Ting ware ting incense burner that it created a commotion in the collecting world at the time. According to a record in "Brush Jottings at the Yün-shih Studio", before creating an imitation, Chou Tan-ch'üan would first "measure by hand" and then make "section pieces" to imitate the decoration, resulting in his finished pieces being almost indistinguishable from the originals. The collector T'ang Ho-cheng admired his work so much that he spent "forty pieces of gold" to purchase an imitation, which he used as a "copy" in his collection. This indeed testifies to the great craftsmanship and influence of Chou Tan-ch'üan.